“I write for you and me and for a gentler, more just world.” Catharsis is a word I avoid using in any context. Even when friends, well-wishers and experts offer it an explanation for what they see happening with me. Or suggest it as a necessary step to deal with an issue. It is not because I don’t like the word or don’t believe in the process. Just the opposite, in fact. I treat catharsis as a sacred precious gift; the word carries so much value for me that I don’t want it made trite in the world of easy sound bytes and trending catch phrases. 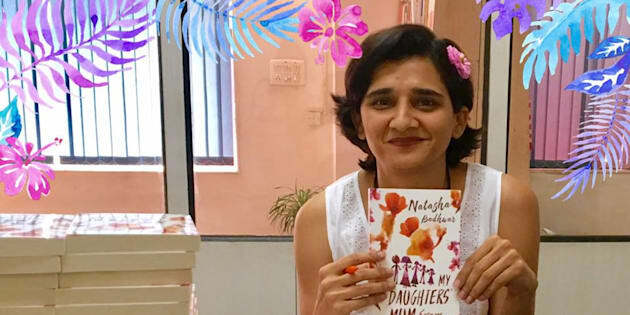 So it is with a lot of thought that I call Natasha Badhwar’s debut book a cathartic read. My Daughters’ Mum is an extraordinary book in its candour. The author writes with such self-reflexive vulnerability that you forget you are reading another person’s writing. You feel your heart spill out on the page. Through tears and smiles, and a heaving and sinking heart the book embraces the reader, cleansing many heartaches and allowing one to celebrate unspoken joys. You recognise memories you had dumped away, you reclaim parts you had been too ashamed to include in your narrative of self. You examine what you have known; you let yourself be drawn into speculating on the unknown. No motherhoods preached, no rules that are claimed as fail proof. Just a brave and honest sharing of personal experiences, insights and revelations. The theme of coming home to a place in this world, and a place inside yourself is the big story of this marvellously loving collection of deeply personal essays. The theme holds together carefully curated sections from Natasha’s long running Mint Lounge column. As a regular reader, it makes me happy that the stories of the column, with their message of love, hope, inclusion and the vision of a different, kinder world now have another home with an even wider accessibility. The editor and writer have skilfully structured the collection in a way that feels like a seamless narration of an ongoing conversation. Part memoir, part essay, part record of our times, there is nothing the book does not touch. Birth family, mothers and daughter, parents, nation, others, love, work, interfaith marriage, friends, grief, death, births, self-love, identity, nationality, changing times, family, in-laws, maids, working from home, road trips, childhood, college, siblings, it is all there, in Natasha’s warm and smart prose. Part memoir, part essay, part record of our times, there is nothing the book does not touch. Natasha’s writing is always crisp, the chapters short and sentences light. Natasha’s writing is always crisp, the chapters short and sentences light. Such nimble handling of weighty and gut wrenchingly loaded topics is a feat this slim book achieves with élan. I have a feeling that the author’s experience as a TV newsperson and filmmaker, and then coach has definitely helped her create this light as air feel for this warm as pashmina coziness of a book. If like me, you are a dreamer who wants to persist on this path despite an often broken heart and habitually weary feet, go get yourself this dose of solidarity and encouragement. Keep the tissues on hand, and start reading. You will go on a journey of your life, I promise you. In Natasha’s words reflecting on the wreckage of a riot she watched as a young girl: “our heart breaks and somehow we keep working. Lives are wrecked and people get back to building homes again. We lose hope and then we find a way to believe once more. We often despair that we are too cynical but we are all constantly creating, restoring, healing, trying to reassemble broken pieces.” I like to believe she speaks for a lot of us.